The Star Wars The Vintage Collection – Jabba’s Sail Barge has just four days remaining to back it. The good news is that anyone who backs the massive vehicle is guaranteed to receive it. That’s right, the Khetanna has been fully funded and is now well past the needed pledges to get produced. They needed 5,000 people to pledge $500 each for this collectible to be produced, and as of this writing, they are over 5,400 backers. 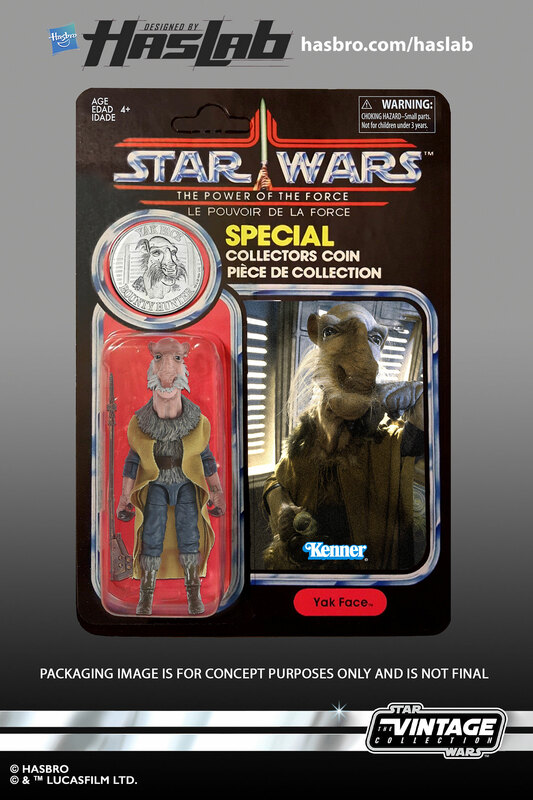 A few weeks ago, they released official fully painted photos of the Sail Barge, and revealed that a Yak Face figure will be included. 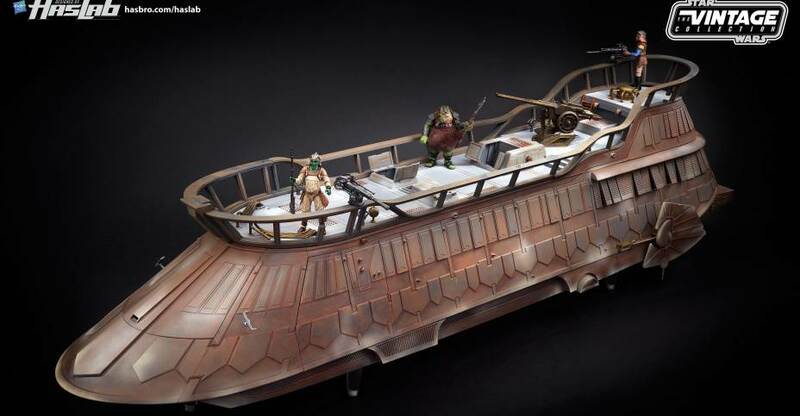 If you’d like to join in the campaign and be guaranteed your very own 3.75″ scale Jabba’s Sale Barge, you can do so by Clicking Here. Once the deadline is up, though, there will be no more orders accepted. Measuring approximately 4ft long, this vast vehicle is a dream item for any Star Wars collection. 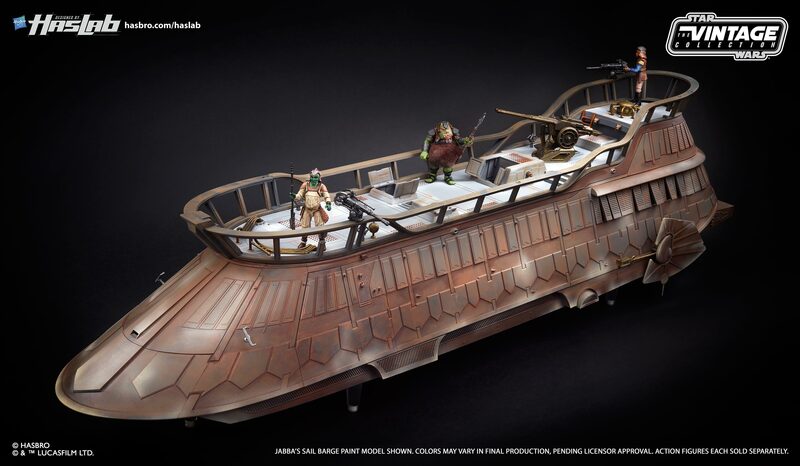 Designed to captivate and inspire, The Vintage Collection Jabba’s Sail Barge (The Khetanna) features exquisitely detailed, fan accessible decks that complement 3.75-inch figures (not included) allowing fans and collectors to recreate intense battles in the Star Wars saga. Its removable side panels also offer a unique opportunity to pose and set up incredible dioramas. Complete with premium deco, vintage packaging, and soft cloth sails, this dream product offers Star Wars devotees the quality and realism they know and love. Included with the vehicle is Jabba the Hutt (3.75-inch scale figure). 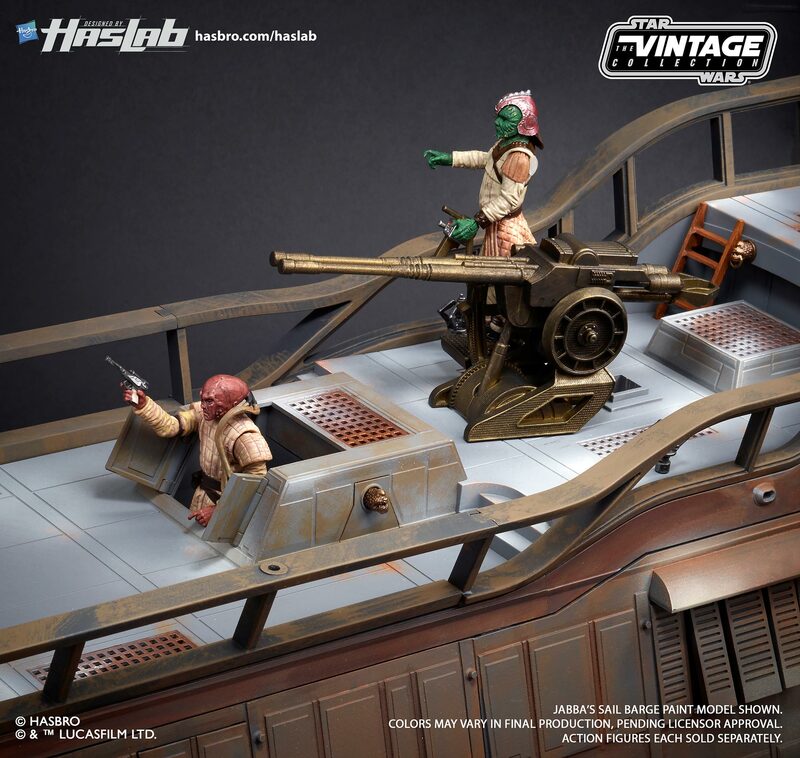 If the minimum number of backers (5,000) is reached by 11:59 EST on April 3, 2018, The Vintage Collection Jabba’s Sail Barge (The Khetanna) estimated ship date is 2/28/2019 and Jabba’s Sail Barge (The Khetanna): Behind the Workbench booklet will start shipping on 4/4/2018. I never thought anything could challenge the awesome BMF,but we have a winner. I have not ordered yet. But I am going to. I am trying to decide for just 1 or 2. I am not in to after market prices or reselling. But this thing if made,in a few years will be that grail that only a few have. I can see this challenging the Flagg and eternia for the most sout after big scale toy. Disney has Star Wars,which means Star Wars is now forever. I still don't think a company as big as Hasbro should have to resort to anything resembling a kickstarter. i say.... an investment with potential!! Considering how some of these high end statues and 1/6 figures could cost several hundred dollars easy, $500 for this beast of a vehicle is reasonable! Why not? It makes perfect sense to me. If they were going to rely on traditional stores to get it made then it would never happen. I don't collect 3.75" but I'm still tempted by this. i think if it gets a lot closer to being made..i just may say fugg it..and go for it. ..and i definitely don't collect now, or anytime in the future..3.75" SW figs. This seems to be doing well. It has close to 3000 with 2 weeks left. I remember with castle grayskull,it was around 70% a few days before close. That went on to make it. I can see 1000 or more on the last day. As this becomes. Loser to going through people start jumping on in fear of missing out. I will order mine this weekend. I keep hopping hasbro includes a vintage collection yakface to go along with it. Holy cow! Entertainment weekly has a new article with the barge painted and it it does now come with yakface on a POTF card! I don't know about posting links here but it is on the front page. If you got to the site. 2100 backers needed, not 1100. If it happens it will take a miracle at this point. Looks they will hit 3000 today..or so. We were on pins and needles with castle grayskull until the las minute. It passed. We need a lot of support,but the amount if people that wait till the last second with this kind of stuff is high. They like to be part of the last push that got it made. Honestly,the way hasbro is playing this,it seems to big to fail. They have no intention of this failing. The press on that would be pretty bad. as somebody who collects Transformers, I want this thing to pass so bad because the possibilities for brands like transformers are huge. me thinks they are afraid to show slave Leia in any pics now. they should have BEGUN the campaign with all that info and color pics..
i'll still get one if those number get close. This guy looks and sounds like a commie. Okay this looks amazing but is everyone forgetting that the evil Kathleen Kennedy has forbid anymore figures of slave Leia to be made ever again so really, what's the point of this set without that figure? We do not speak of the nameless one. I use to think she was the devil,I now know he worships her. Anyway,many fantastic slave leia figures exist. I hope this is a joke, and that there aren't people so pathetic as to not want this because they might not get a new Leia Huttslayer to go with it. No, he sound like someone who isn't corporate shill and mindless adult collector throwing his money away and justify every bad purchase. Barge is now close to 3500. I am also reading rumors over various sites that at least one more figure might be included. I haven't been this engaged for a toy since castle grayskull. Hi, Comedian. What other sites do you typically use? I would love to see more discussions on this Sail Barge. Thank you. The Star Wars thread here you could try,but it seems to be mainly 6" talk. But rebelscum has a like 500 page thread in their vintage collection forum. I would love to see more discussions on this Sail Barge. Thank you. You'll love Jedi Temple Archives then. Literally every other article posted is about the barge..to the point where it's actually kind of obnoxious, so I don't even visit that site anymore lol.